I got paid... from one school, that is. Although they still haven't received my money for January from the Consejería de Educación, my Tues/Weds school fronted me the money today. Halfway through February, and the Consejería de Educación still hasn't sent out the money to pay many auxiliares their January stipend. I haven't yet seen any news stories about it like there were in December, but I'll keep my eyes open. Since my Mon/Thurs school doesn't have enough money to pay me for January out of their own funds, we're still waiting until the Consejería deposits the money into the school's account. From the auxiliares' facebook page, I know that some of the unpaid auxiliares were planning to go to the Consejería's office on c/ Gran Vía this afternoon to submit a formal complaint about not having been paid. For the auxiliares from the United States, this much of a delay in getting paid is simply not acceptable. But after spending a year and a half here, I know that this is Spain, and one must be patient. The money won't come any sooner next month, so you might as well expect it and plan ahead. This is one of the areas in which Spain falls short of the United States. I'm not actually sure what to call it, but it encompasses government workers, administrative processes, legal documents and applications, and the like. For starters, though not the most directly related, the technology in this country is about 10 years behind that of the United States. The ancient computers in my schools are slower than slugs. I remember when I was a student at the Complutense here, it was risky to work on a university's computer with a flash drive because they would almost always give your flash drive a virus. The ten-year lag is also easily noted in web pages. A majority of all the Spaniards I know have either a yahoo or hotmail email account. See what I mean? 10 years behind. Only an elite few have discovered the beauty and efficiency of gmail. 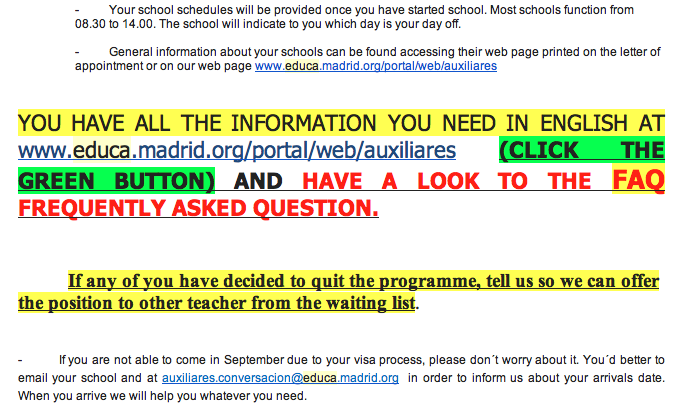 Notice how the caps, bright colors, and underlining make the e-mail so official and easy to read. After months of collecting documents this summer to apply for my visa, I was convinced we had the slowest governmental systems ever in the United States. 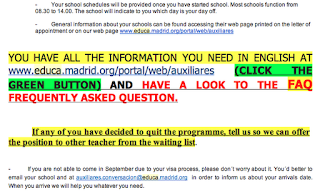 And then I applied for my residency card (TIE) in Spain. I won't go into detail, because you can read about TIE confusions from the beginning of the year here; but when auxiliares were calling to make appointments to apply for this card, some were told that there weren't openings until September 2012. September! They would have been back in the states by then! And that's just to apply. They would then need to wait another month or two for the actual card to be made (if the applicant had had all of the necessary documents at the appointment). It's common that asking different workers the same question will result in completely different answers. How can there be that much uncertainty/variation when dealing with important legal applications and documents? Or you may get sent to another office on the other end of the city. Once you arrive, don't be surprised if they tell you that you should actually be in the office you just came from. It took one of my roommates two years to transfer his degree from Venezuela so that it would be recognized here in Spain. Two years of papers and signatures and stamps and seals and fees. Two weeks ago the morning English teacher at my Tues/Weds school was late to class because she had spent hours in a governmental office trying to complete some documents needed to renew her teaching license. The week before she had gotten these documents from the same office, but the workers forgot to fill in a date in one part. So she returned the following week - the day she arrived late to class - to have them fill in that date they had missed. Of the twenty-five desks in the office she went to, only five actually had people behind them, working. So she waited over an hour in line until she could finally talk to one of those five people. The first person wouldn't fill in the date for some reason or another. They couldn't find a record of the date she needed, so they couldn't write it on her form. In the end, she had seen three of the five workers who were there that morning, and none of them would fill in the date (which they should have done the previous week, but forgot to do). Clearly, she was frustrated and bothered when she finally made it to class. I can understand why. So now I'll leave you with a short video. It pokes fun at government employees (funcionarios) in Spain. Maybe it will better show what I was trying to explain. And no worries, there are English subtitles! And I think it goes without saying, but I'll say it anyway, that the opinions expressed in this post were formed by my experiences growing up in the states, and my experiences here in Spain. I realize my views are probably tainted. So please do share yours! For anyone who lives/has lived in Spain, what are your thoughts on the efficiency of the governmental offices? What experiences have you had? How do they compare to those from your home country (if you're not from Spain)? No son eficientes, pero mi experiencia en Australia me dice que aquí son parecidos... El proceso de convalidación de títulos se hace misión imposible y tienes que pagar tasas y tasas y bastante mas caras q en España. En cuanto a tu experiencia. Es indignante, pero tengo conocimiento de otras personas que no han tenido tan mala suerte para reclamar el salario de auxiliar. Pillaste con el funcionario erróneo. Gracias por compartir tu experiencia en Australia! Sí, no tenía tan mala suerte yo para reclamar el salario - sólo llegó tarde unas veces. Otros auxiliares llevaban meses (2-3) sin recibir el sueldo. Pero al final y a cabo, todos fueron pagados - es lo importante.